For many hair styles, the most difficult part of achieving the right look is to keep it in place, and that is where hair spray is the most useful product to use. Before grabbing a can and spraying down your locks, however, it is important to understand the different types of spray and how they should be used for the most effective and beautiful results. Garnier Fructis Style Sleek & Shine Anti-Humidity Ultra Strong spray is designed for ultimate frizz control combined with shine, softness, and lasting control. L'Oreal Elnett Satin Extra Strong Hold UV Hair Spray protects hair from harmful sun exposure while providing a firm hold without any sticky residue. TIGI: Bed Head hairspray, which is available in three different formulations, Hard Head, Masterpiece, and Maxxed Out, is a TIGI product. Whether you need light or maximum control, Bed Head has a product to suit your needs. Paul Mitchell: The Paul Mitchell name and top quality hair care products are well-known to most. Their product line includes 10 different hair control formulations to cater to the needs of any length and texture of hair. Sasson Finish Products: Whether you need to tame wet or dry hair, enhance your cut and style, or just add some silky sheen to your tresses, Sasson Finish products can deliver the look you need and want at a price that won't damage your finances. Honeybee Gardens: In addition to being alcohol-free, Honeybee Gardens hair spray does not contain any propellants or PABA so it is as kind to the environment as it is to your hair. Sally Beauty: Buy Ion Alcohol-free hair finish at your local Sally Beauty supply store or shop online. Organic Excellence: Tame a wild mane with Organic Excellence's Wild Mint Styling Spray. Get all the benefits of a great holding hair finish product without any of the negatives of harmful alcohol contents. Flexible: This is a mild to moderate strength spray that lets hair move naturally with body motion or wind without destroying a style. Strong or extra strength: These holds are meant to keep nearly all hair in place and are suitable for different weather and activity conditions, as well as more elaborate hair styles that require greater assistance to maintain their shape. Maximum, ultra strength or freeze: These holds are the strongest available, which are meant to dry quickly and hold very elaborate styles in place under adverse conditions. Scent: Fruit and flower scents are available as well as unscented varieties. If you use a very fragrant shampoo or conditioner, choose unscented spray or one that coordinates with your other products. Delivery method: Aerosol sprays provide a continuous stream of product, while non-aerosol pump sprays deliver small bursts. Choose which one works best for your overall style. Protective properties: Some sprays are humidity resistant or offer UV sun protection. Choose these products based on your hair care needs and local climate. Hair type properties: Some sprays offer special care for specific hair types, such as ethnic hair, curl lock formulas, anti-frizz, or color brightening properties. Feel: Some sprays advertise as being non-sticky and non-shiny. It is best to experiment with these and choose the ones that work best for your overall look. After understanding what types of styling sprays are available, it is crucial to consider which one will work best with your particular hair style. While some sprays are recommended for specific types of hair, the biggest consideration you need to make when choosing one is whether it will work for your style that day. Many users keep a number of different sprays on hand so they can choose which one works best with different looks. For example, if you plan on being outdoors on a windy day, you may want to consider a stronger hold than normal. If your style only needs hold in a few small places, a non-aerosol product may be best. For a more natural, casual look, a flexible hold spray is a good choice, while elaborate or punk styles may require far stronger holds. 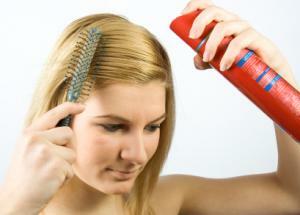 Using a spray properly takes more than just holding it near your hair and pressing a button. For the best looking style, you must consider exactly why you are using the spray and how to achieve fabulous results. In general, the spray can or bottle should be held upright 8 to 12 inches from the hair (aerosol sprays should be held further away than non-aerosol products). Always remember that most spray is inflammable and should never be directed at a heating tool such as a curling iron, hot hair dryer, or straightener. A single loose connection or spark could have disastrous and dangerous results. Furthermore, avoid getting spray in your eyes to avoid inflammation. When styling, apply the spray as you work with your locks, perhaps even while they are still wet. Brush the spray into your hair and immediately bring it into the desired position - most sprays dry quickly and a delay could distort your look. An additional short burst of spray can help finish the look and hold it in place. For the strongest hold, style your hair and then spray thoroughly over the style, possible holding a tricky part of the style in place while the spray sets. Allow a few seconds for the spray to dry well for the maximum hold. To create greater volume with your style, apply the spray on the underside of your hair before styling and brush it upside down for a few seconds. This will help the hair lift off the scalp for the maximum volume. Afterwards, style your hair as desired, using additional spray for hold if necessary. If sprays do not work for your style, there are other products specifically made for styling. Mousses and gels are the most popular types, and they can be applied to either wet or dry hair to help hold it in place in a particular look. They may not have the flexibility of spray, but they can work with many different styles. Hair spray is a useful product for most hair types and styles. When chosen and used properly, it can help create and hold many spectacular looks, from simple, easy styles to elaborate updos.